A couple of weeks ago I made this, it was good. I didn’t follow a recipe as such, more like I looked up 3 conflicting recipes and dredged up memories of how I used to make it back when I still lived with my parents and then Nanny Ogged* the process. Then someone asked me for the recipe, so clearly I was going to have to do it again, only writing it down as I went this time. Which I did tonight, and I made this, it was also good. 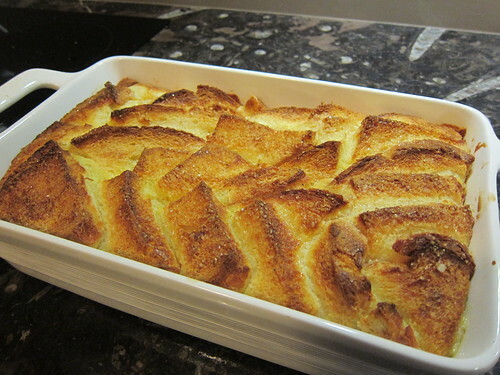 Lightly grease a baking dish with butter. 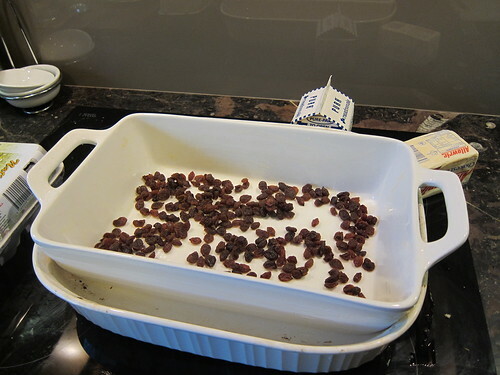 Sprinkle sultanas over the bottom of the dish, if you like lots use lots, if not don’t. Next up is the custard, I used 300mL of cream, 900mL of milk, 3 eggs, 3 tablespoons of caster sugar and 1/2 a teaspoon of ground nutmeg. Whisk them all up and pour over the bread. 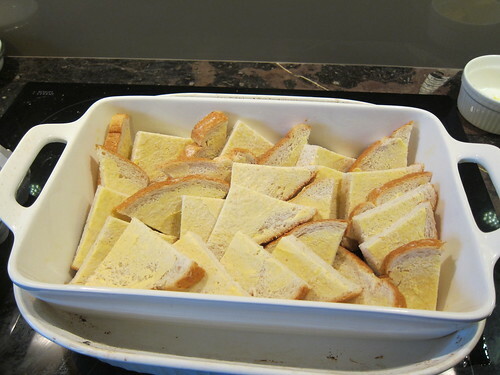 Poke the bread down into the mixture and then let it stand for a few minutes until the bread has soaked it up. Sprinkle the top with a dessert spoonful or so of demerara sugar. Pop the nested baking dishes into the oven. Keep an eye on it, if the top is browning too much before the custard sets then turn the oven down. I turned it down to 150°C after 30 minutes. The custard is set when the bread all puffs up, but sticking a knife into the middle and having a look is a good way to tell too. After an hour the custard had just set and the top was well browned. Cooking smaller quantities is easier when it comes to getting it cooked through without burning the top. 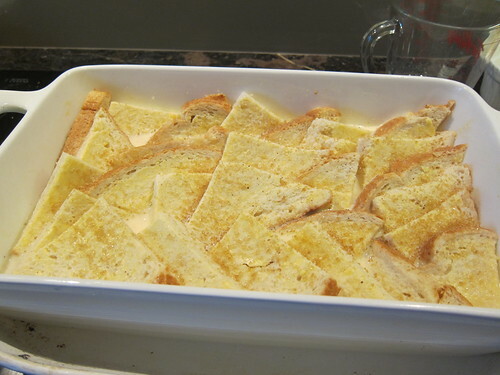 I then took the pud to my mum’s place where a roast pork dinner was waiting for us, this also explains the large quantity, I was cooking for 7 of us and could have served 8 easily from this dish. If you’re lucky 2 of your kids will decide it’s not for them and there’ll be leftovers for tomorrow night. Wow that looks good. 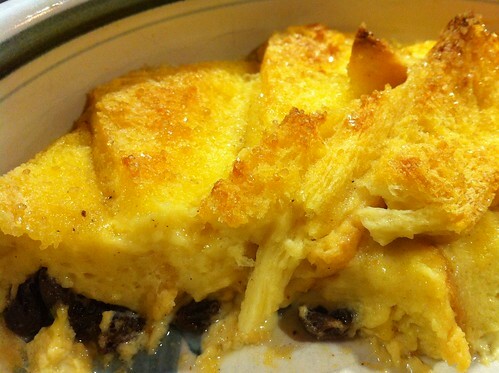 Bread and butter pudding and rice pudding never goes out of favour. I have pinned it to TKAAR Pinterest board. 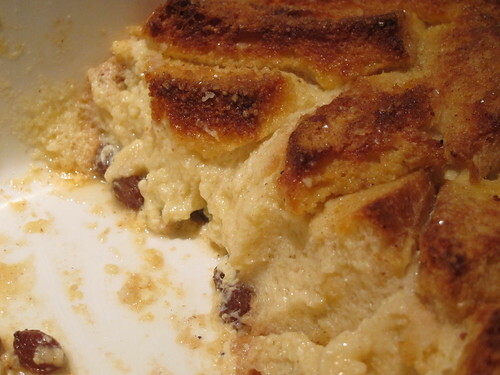 I once made a brioche and nutella pudding which was insane. Yummo! This looks fantastic. Have a great week!! Yes! I did this pudding again recently too. (Double cream with it – sinful.) Son has suggested a chocolate version using choc bits instead of sultanas (which he dislikes) and chocolate milk. Nutella instead of butter would probably be the go, too. We’ll do it someday – it will either be heavenly or “totally gross”. Good lord! The mind boggles. You’d have to watch the sugar levels, commercial chocolate milk would make it sickly sweet I’d imagine. 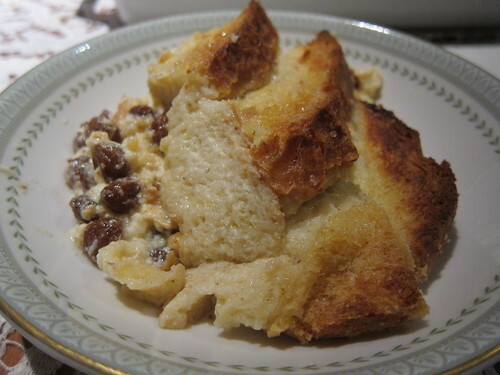 Plus I reckon a chocolate version would require something other than plain bread – maybe panettone.